Spacious unit in historic Victorian home with garage parking. Includes fully stocked kitchen, full bath, washer and dryer, large living room with 47” 3D WIFI LCD TV, Bluetooth soundbar/subwoofer, desk with computer and Internet, twin day-bed, and a huge bedroom with two (2) queen-sized beds, walk-in closets and a 32' LCD TV. The apartment gets wonderful morning and afternoon light. Enjoy people-watching from the front terrace or cook up some dinner with the gas grill in the back yard. Complete your day with a relaxing dip in the hot tub! Walking distance to Haight Street Market and Whole Foods. The Panhandle park is just across the street with bike paths into Golden Gate Park, Academy of Sciences and the de Young Museum. Just one block from the bus lines that go to Union Square, Chinatown, Fisherman's Wharf and the Ferry Building. There is also a queen-size Aerobed with bedding in the closet to sleep addition guests. Apartment is fully stocked with DVD movies, cable TV and Netflix, WIFI and an office computer and internet connection. Full bathroom with shower/bath tub. Towels, robes, shampoo, conditioner, shower gel provided. Also provided are hair dryer, toilet paper, q-tips, cotton balls, and first-aid kit. We recently stayed in this stunning home for the delivery of our second child and absolutely loved our time here. The house greatly surpassed all of our expectations. It is fully equipped with everything we needed, plus much more! The kitchen was clean and fully stocked. The bedroom was spacious with two very comfortable beds. The backyard was quiet, with the bonus of a hot tub to spend time relaxing in. The bathroom had everything we needed with a nice shower/tub. We loved the big living room with all of the natural light. It was so enjoyable to be in this home and really felt like a home away from home. Furthermore, the location couldn't have been better. We frequently walked to Golden Gate park to explore playgrounds, the carousel, and all the parks with our two year old. Whole Foods is just a quick walk away. The house was also close to the zoo, beach, restaurants, and doctor appointments at UCSF. In addition, Ryan and Tricia were wonderful. They are such congenial hosts who make you feel right at home. 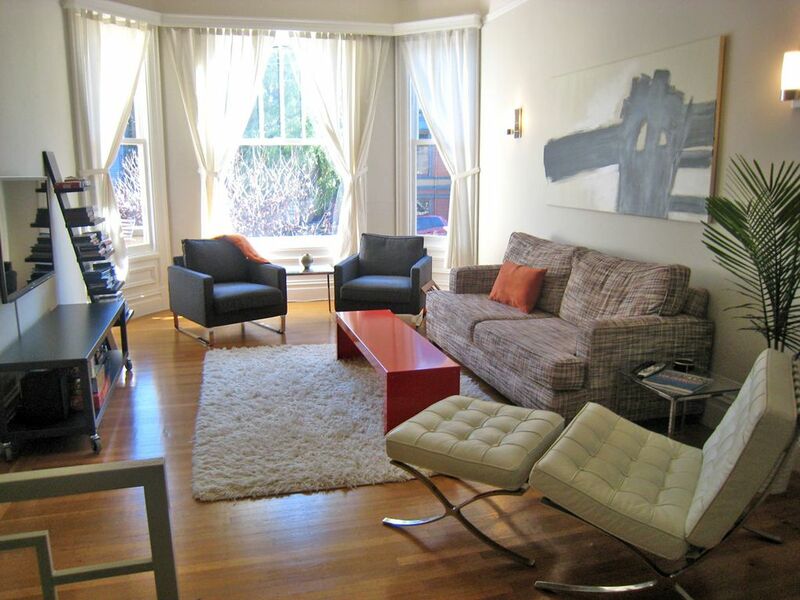 We would recommend this home to anyone looking for the absolute BEST stay in San Francisco!!!!!! We were all sad to leave but hope to come back again in the future. This was the perfect place to stay for three months. The flat had everything we needed, including parking, a ping pong table, HBO, backyard dart board and laundry. Parking in SF is very rare so we felt extra lucky to know the car was safe in the garage. And there’s a locked front gate. The Haight is such a fun lively and historical place to stay. Being a block from the panhandle and a few blocks from Golden Gate Park was wonderful. The pictures are beautiful and still don’t do it justice. The high ceilings and huge bay windows lit the place up. We also loved how all the light switches were on dimmers. Ryan and Tricia are the friendliest most gracious hosts and have the best recommendations on places to go since they’re long-time locals. Plus there are multiple beds and air mattresses, so if you have guests visiting there’s plenty of room for them. If it’s available it is a must book. We will absolutely stay there again! Thanks for everything! Had a wonderful stay here, Ryan the owner is really great to deal with, the apartment looked exactly like the pics, clean, spacious, very easy. You have shops nearby for all your groceries etc, transport is easy from a short walk away - whichever area of the city you want to get to. Very well equipped kitchen for a short term rental, which for us was great as we enjoy cooking, great laundry facilities, the BBQ, garden and table tennis room are all a bonus. The patio at the front is great, you can sit, watch the world go by and the sun on there is so nice! Highly recommend. Makes for a great stay and we would come back any time. Great location, safe and clean! Landlords were great, kitchen well stocked, would highly recommend for anyone looking for a place in the Haight or near the Hospitals. Have just returned from the AMAZING flat in Haight Ashbury. As many have said, it is exactly as pictured...but more. The home feels like "friends" live there; coffee, spices, other treats in the kitchen; nice crisp sheets on the bed "for company"! The bathroom could support all guests with towels, toiletries, and a blow dryer. An added bonus--great water pressure. There is a laundry room for use, a beautiful outdoor space with the hot tub. I found my way to the dart board, ping-pong table, outdoor shower and extra bathroom. We walked most places, or it was a quick Lyft to other areas of the city. Your hosts are accessible, responding easily to any concern. After our daughter's graduation (Master of Architecture) and a dinner celebration, my family collected here in the evening...so much laughter and love. Thank you for helping build some family memories. Stay here, you will not regret it. We had such a great time! This was our first trip to San Francisco. We had our 4 teenage kids. This property was clean, full of ALL the needful things. Ryan let me use their crockpot for the day, he even came in and fixed the aero beds for us. We loved the game room downstairs and the jacuzzi. Everything was perfect! Thanks for letting us stay and we would recommend this flat for sure!